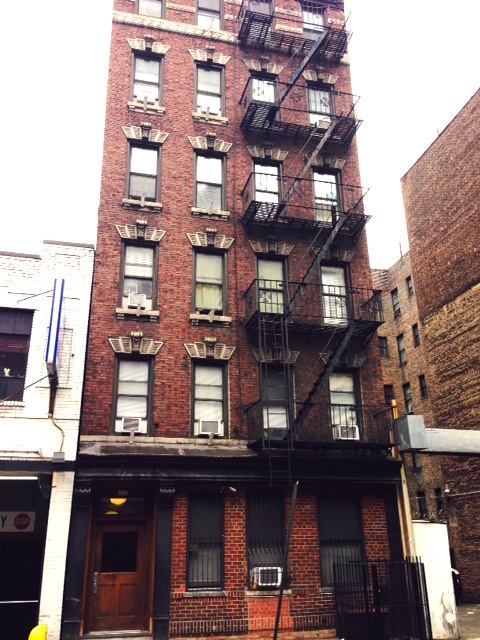 In the late 1970’s I lived in a fifth floor walk-up railroad flat in a Hell’s Kitchen tenement at a time when the Irish mob still controlled much of that section of Manhattan and it was considered undesirable by the gay men who inhabited the West Village and the Upper East Side. With the closing of the Hudson River piers the dock workers and their families who had lived for the better part of a hundred and fifty years crowded into the closely packed tenements left and were replaced by Puerto Ricans who had begun arriving in New York in the 1950’s, finding life in the slums of the Westside a step up from the dire poverty they had left behind them. I’d been living in a tiny studio on the east side of Ninth Ave. on 45th St., which was in the Theatre District, and, for some reason, considered a more desirable area in which to live, despite the fact that it was just as dangerous there as it was on the blocks off the river. One dreary January afternoon as I was making my way down Eighth Ave. from a dance class, I ran into a guy I waited tables with who lived in a tenement on the next block from mine. He excitedly told me that an old Greek woman in his building had committed suicide by climbing out her kitchen window onto the fire escape and jumping to the street below. He knew I’d been looking for a bigger place so told me that if I wanted the apartment I’d better get right over there and talk to the superintendent. Without even stopping home to drop off my dance bag, I ran over to his building on the other side of Ninth and found the super. We talked for a few minutes and after some money changed hands he gave me the keys. I went right upstairs and was relieved to find that it had been cleaned out so all I had to do was paint and move my things over from my old place. My first evening in the new apartment, I heard for the first time what would become an almost daily occurrence: the muffled sound of a woman crying and wailing. I stopped what I was doing, went to my door and undid the deadbolt and security chain before opening it just enough to stick my head out onto the landing. The weeping was coming from the apartment across the hall. Every few moments the wails were punctuated by a deep sob, as if the woman from whom those pitiful sounds emanated had been punched in the gut. I knew I was listening to something that should be private, but stood there transfixed, knowing I ought to go back into my apartment, but unable to close my door as I found myself unsettled by the sounds of the suffering I was overhearing. I was pulled down into the world of memory to when I was a child and would hear my mother crying in the cellar of our farmhouse. I’d tiptoe through my parents’ bedroom and crack open the door that opened unto the stairs that led down into the dank basement and listen to her quiet sobbing. My mother, squatting behind the wringer wash machine, escaping for a moment the tedious farm life in which she was trapped, the solitude of that space giving her a chance to mourn the loss of her city life in Germany that had been destroyed in the war—family killed in the bombings, her first husband presumed dead in Russia, the daughter abandoned, her dreams turned upside down. She was alone in a strange land, married to a man she did not love, and raising children she did not want, the untreated wartime trauma slowly leading her from despair to depression and eventually to madness. I stood there waiting, waiting for my mother to stop crying, waiting for her to come back upstairs to care for me. But even then I knew that was not possible, that, in fact, she was waiting to figure out a way to leave us and return home. A sharp cry brought me back from the place of memory. I was no longer that boy, but a young man finding his way alone in the big city, standing there in the doorway of a tenement flat immobilized, just as the boy had been, listening to the awful sounds of grief and desperation, while feelings of helplessness rose up within him. Anna crashing a party I gave in my flat. All I could do was nod my head as she stood there smiling at me. Finally, not being able to stand the awkwardness any longer, I said good night and stepped back into my apartment. As I started to close the door she looked at me and uttered, “Tasia, my friend…..dead.” Anna began to weep again and then slowly turned around and shuffled back into her apartment. I waited for a moment while she locked and bolted her door, the sharp ratcheting of the metal echoing down the stairs, the air so thick with despair and loss I could hardly breathe. 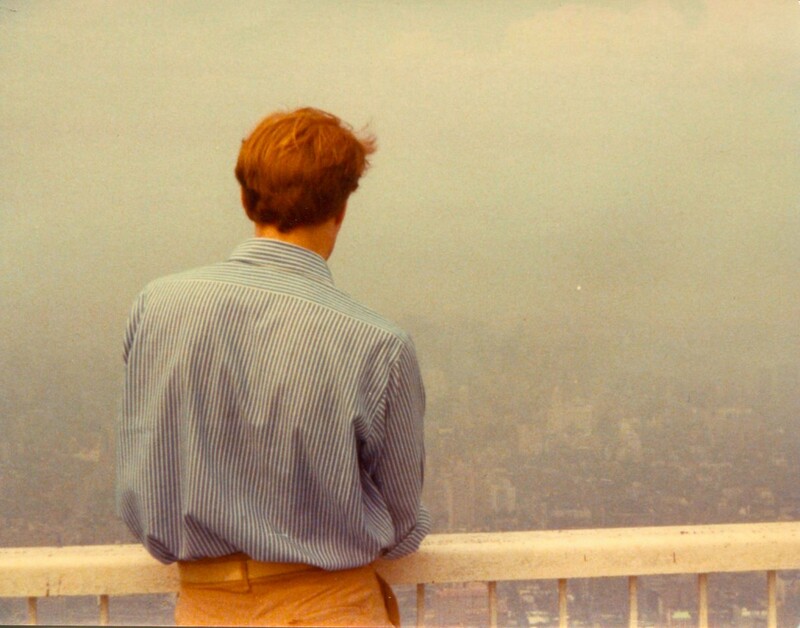 Feelings of hopelessness like those my mother felt so many years ago came over me, but I shook them off, not wanting to be pulled down into the despair to which they inevitably led. Taking a deep breath, I closed my door, locked and bolted it, and took refuge in the space in which I had come to live, the space which had known such misery and anguish. 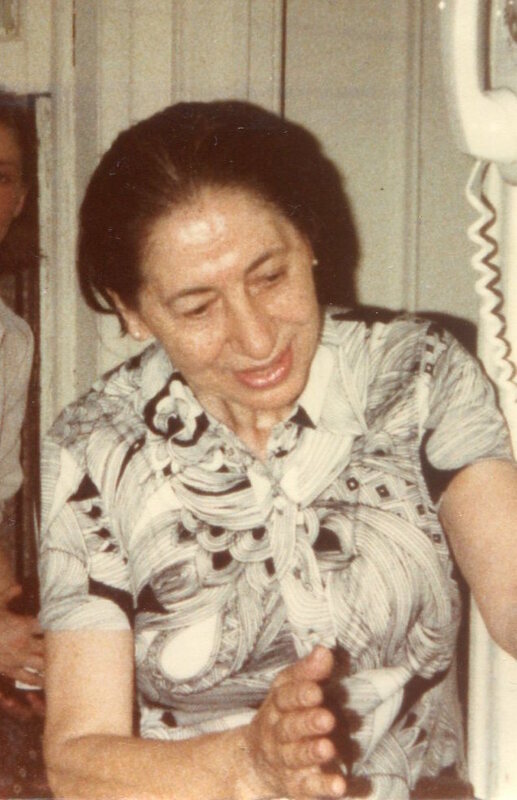 In the weeks that followed, I would hear Anna banging around in her apartment talking to herself in Greek. Sometimes, as I hauled myself up the ten flights of stairs with a bag of groceries in one hand and if I were lucky, a beautiful Puerto Rican boy in the other, I would hear her crying as she sat alone in the darkness. I’d stop for a moment on the landing, careful not to linger too long, not wanting her weeping to trigger memories of my mother. As quickly as I could, I’d unlock my door and just as fast close it behind me in order to escape those sounds of sorrow and grief. Besides, there were more immediate things that needed my attention. When summer came and the afternoon heat became unbearable, Anna would prop open her door in order to draw air up the stairwell and into her stifling apartment. She usually sat right in the doorway, but if she heard me getting ready to leave she’d hurriedly shut the door so I wouldn’t see her. However, one day as I stepped out onto the landing she must have been in her kitchen so I was able to look into her room, a space which seemed inhabited rather than lived in. The windows were covered with stained threadbare sheets and the only pieces of furniture were an old table with a chair and a small bed in one corner. On both sides of the door, lined up along the walls were boxes tied with twine, some suitcases, and a large steamer trunk. One evening, after I had come home from work and was getting ready to go out for the night, I heard a knock on my door. It was Anna. As usual she was talking so quickly and in such broken English that I couldn’t understand much of what she said. It sounded like she wanted me to come over to her place to help her or something. At first I hesitated, not wanting to get caught up in Anna’s craziness, but she grabbed me with her strong bony hands and literally pulled me out of my apartment and into hers. Anna disappeared into the kitchen for a moment before returning with a spoon and a small, porcelain bowl filled with white beans. She said they were lucky beans that would help me find a wife. I wasn’t at all hungry, especially not for what was in the bowl, but not wanting to hurt her feelings, I put a few of the beans into the spoon and lifted them up to my mouth. “You like?” she asked before I’d even taken a bite. 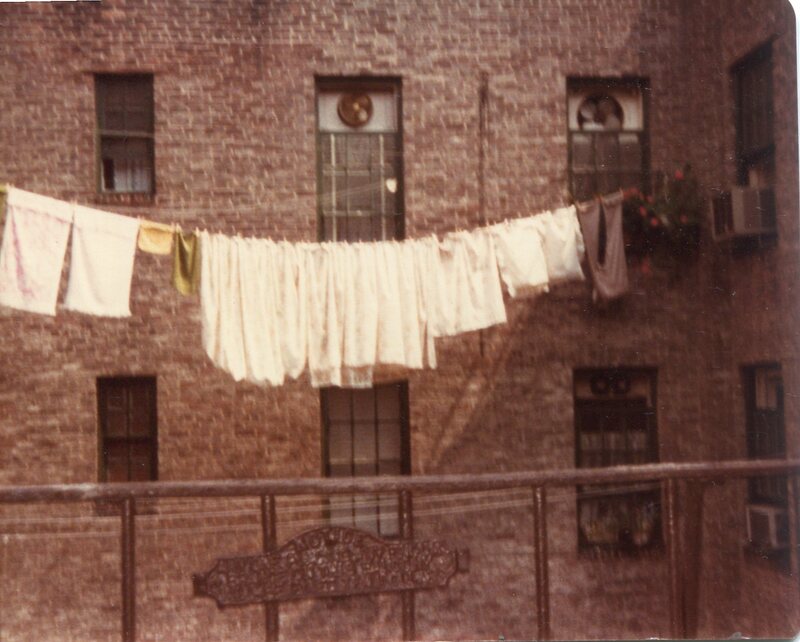 Anna’s laundry strung on the clothesline attached by pulleys to the tenement behind ours. Anna walked to the table and pulled the chair over to where I was sitting on the trunk and sat down. The stagnant air hung thickly around us as we sat there without speaking, Anna watching me slowly eat the tasteless beans while I breathed in the musty smell of her room. “A house in Greece?” I asked. As I looked down into the old chipped bowl at the last of the supposedly lucky beans, I heard coming from deep inside Anna the most horrible sound, like that of a wounded animal that has crawled away somewhere to either heal itself or die; the same sound that I would hear coming from my mother while she squatted in the basement; my mother, like Anna, waiting to go home, home to a place that no longer existed but in her memory. My mother eventually did come back upstairs, but she never became a mother. Even though I waited, just like Anna waited for the boat home that would never come. After a few years of living in our tenement in Hell’s Kitchen, I moved across the continent to start a new life on the West Coast; a life filled with hope, promise, and opportunities. The day I left I knocked on Anna’s door to say goodbye, but she didn’t answer, even though I could hear her muttering to herself and crying. I don’t know what happened to Anna. But in my heart I know that, like her friend Tasia, she did make it home. Not to Greece, but home. I remember Anna and some of the beautiful people at that party, many of whom died within the decade—another story I am certain. Hugs and Love. A beautiful yet sad story. But then again so often sad things are beautiful in their own way. I spent 4 years just one block north of you but didn’t move there until 2009. Even then the neighborhood still had vestiges of other cultures but obviously not like it was. Your story reminds me of ones my mom and grandpa would tell me about a new york that no longer exists. My grandfather was a Russian immigrant who lives in the LES tenements and often spoke of the hardships of his compatriots. He’s gone now, like so many others, but these stories still ring in my ears as i wander the streets of the city. New gays from Ohio, Pennsylvania and other points west, only just arriving (this time by plane) sadly have no idea what Old New York was like. While i’m only in my 30s I’ve taken it upon myself to continually remind my younger friends of what was and what will no longer be. In this city of ever-rising steel and glass, there are always echoes of something more earthly and rich, if you listen. Thanks again for sharing. Zach, thanks for sharing what you did about your family. I’m glad that you are learning of the history of the city and of it’s gay citizens. You might like “Gay New York: Gender, Urban Culture, and the Making of the Gay Male World, 1890-1940)” by George Chauncey. Every old building in New York has a thousand stories. 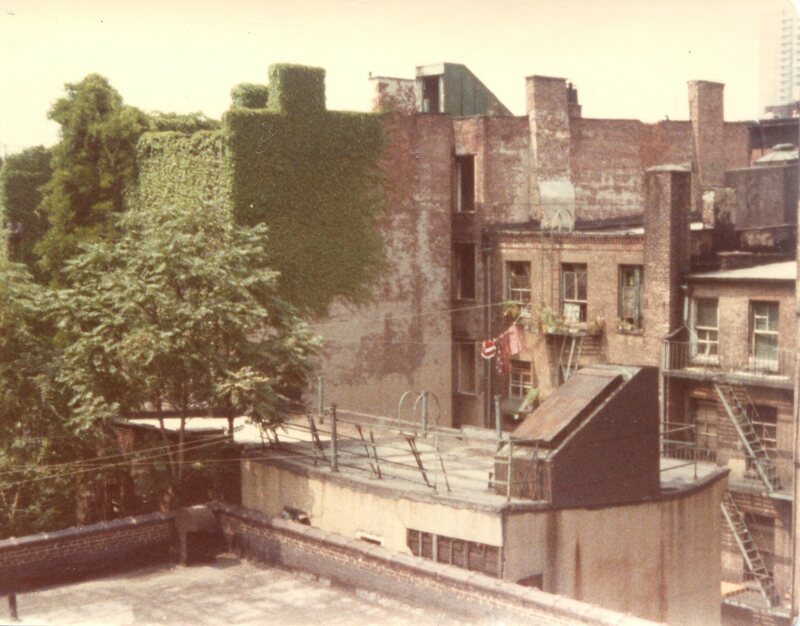 Those tenements on the LES where your family settled after escaping the pogroms in Russia are especially fraught with suffering, but ultimately–victory. Peace to you, brother.